The town of Varadero is set in a vast bay on the Hicacos Peninsula within the Matanzas Province, on the northern coastal tip of Cuba, and is one of the biggest resort areas in the entire Caribbean. Varadero is fully set up for tourism and functions as a major Caribbean destination for a number of package tour companies based in Europe and Canada. The wide selection of hotels and other accommodation, clear turquoise water, glorious beaches, Cuba's only 18-hole golf course (the Xanadu Golf Club), great weather, water sports and spectacular surroundings all combine to make Varadero the ideal holiday destination. First visited by holiday makers in 1870, the town quickly became an exclusive resort for wealthy Havana residents. By the 1930s, elite tourism was fully established, extravagant mansions were built and the famous and infamous, including Al Capone, began arriving from the USA. The town's appeal to visitors has never faltered, with tourism still the mainstay of Varadero's economy and over 500,000 visitors flocking to the resort every single year. Varadero is a long way from being the real Cuba, as it is a state-controlled tourist environment with very few Cuban visitors, but it does provide convenient all-round facilities for a great beach holiday. Tourist information can be accessed at hotel front desks or from the travel centres in town (often state-owned), such as Cubamar, Cubana, Cubatur, Gaviota, Havanatur and Infotur. The white sandy beaches of Varadero stretch for over 20 km / 12 miles, meaning that it is never too hard to find somewhere away from the inevitable crowds of summer holiday makers. If you enjoy scuba diving, then the Cayo Piedras del Norte is a serious marine park with a number of specially sunken boats. An easy way to explore the coastline is by boat, and with no less than three harbours to choose between (Chapelin, Darsena and Gaviota), arranging a suitable sightseeing cruise couldn't be easier. Those who prefer to stick to 'terra firma' may like to check out the grounds and rather extravagant interior of the Mansion Xanadu, or pay a visit to either the Parque Central or its adjacent cousin, the Parque de las 800 Taquillas. For families, the Dolphinarium (Delfinario) may appeal and many people come here each day to get up close to the dolphins and watch the regular shows. 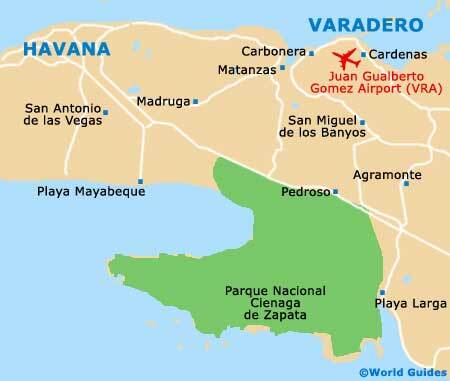 More information about Varadero Tourist Attractions and Varadero Beaches. Varadero is first and foremost a beach resort, and as such, the town's main landmarks are generally natural, rather than being man-made. The Hicacos Peninsula offers much interest and plenty of pretty beaches, as well as being home to the Varadero Ecological Park (Reserva Ecologica Varahicacos), where hiking trails and caves with ancient wall paintings await. Spanning the Yomuri Valley, the Bacunayagua Bridge (Puente Bacunayagua) is quite a sight and lies on the road connecting Matanzas with Havana. Other landmarks include the traditional houses and statues based on the Guama island complex within nearby Treasure Lake. More information about Varadero Landmarks and Monuments. For a little culture away from the beachlife, Varadero comes with a couple of museums. The Municipal Museum of History (Museo Municipal) is housed within an old building of much historical significance and contains an assortment of pre-Columbian artefacts and relics, as well as boasting some great coastal views. At the Casa de la Cultura los Corales, information and exhibits relate to Cuban art and folklore, while more offerings lie outside of the city, in nearby Cardenas and Matanzas. Further away in the Cuban capital of Havana, both the National Museum of Fine Arts (Museo Nacional de Bellas Artes) and the Havana Club Rum Museum (El Ron Havana Club Museo) are of great merit. More information about Varadero Museums and Varadero Art Galleries. Being just two hours away from Havana makes Varadero all the more accessible and appealing. With an early start, day trips to Havana are quite possible and the wealth of tourist attractions within the city's Old Quarter (Habana Vieja) is quite overwhelming. Amongst the best of the other possible excursions are trips to the Ernest Hemingway House, the very small and peaceful town of San Miguel de los Banyos, the busy harbour town of Cardenas, and the paradisiacal Zapata Wetlands, where rain forests, caves, trails and over 300 bird species are to be found. More information about Varadero Attractions Nearby.